It is a top priority at Friendswood Hardware to provide you with excellent organic & all-natural product choices. For your lawn & garden, we cannot recommend MicroLife enough. Their philosophy is all about creating a healthier soil, which in turn leads to healthier plants & lawns. You can use their products on the lawn and in potted plants alike. 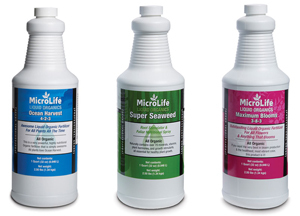 You can feel good about using Microlife as it won't burn your plants, and won't leach anything awful into your water. In the granules, we carry the 7lb refillable containers of the All-purpose 6-2-4, the Citrus 6-2-4, the Ultimate 8-4-6, & the Azalea 6-2-4. We also carry the 40lb bags of the All-purpose 6-2-4, the Ultimate 8-4-6, the Humates Plus 0-0-4, & Brown Patch 5-1-3. In the liquid concentrate solutions, we carry Super Seaweed, Ocean Harvest, and MaxBloom. Scroll down to the bottom of the page to see the recommended fertilizer schedule. In place of Round-Up, we can proudly recommend Burn-Out Weed & Grass Killer Concentrate, by Bonide, as an alternative! Employee-tested and true. We have many different products to keep your plants pest- and fungus-free, including: Neem Oil, Captain Jack's various pest products, Safer Soap, among many more! We also carry a selection of organic houseware brands: primarily Meyers & Full Circle.